She walked quietly on the surface made up of billions of hard, glittering diamonds. Beautiful, sparkling and sprinkled everywhere like sand on the beach, they glittered beneath the pale sky as far as the eye could see. Barefoot, clad in a loose pure white flowing gown. A lazy breeze naughtily pulled her luxuriously thick and soft long white curls. She was a young slim girl, pale like the pastel background she walked upon. Until you saw her eyes. Beautiful big almond shaped eyes, warm and loving, the color of mahogany brown. Her gaze was usually lowered, lost in her thoughts, wondering how despite the frequency of pain, she still hadn’t gotten used to it. She looked at the desert of diamonds around her. The diamonds glistened underneath the sun as far as she could see. She lifted her long curly lashes to gaze at the sky. The sun tenderly kissed her on her cheeks. She allowed herself to relish that precious moment. Before closing them again and smiling sadly. It was that time again. Slowly she turned around. Her eyes sad, she looked at where she had been walking. The diamond desert looked deceptively the same from everywhere. Yet she could always make out her footsteps. Her steps were painted with the trail of bright red blood that was left on the diamonds that cut through her bare feet, demanding her to stop her journey. She did not want to leave behind evidence of the pain. 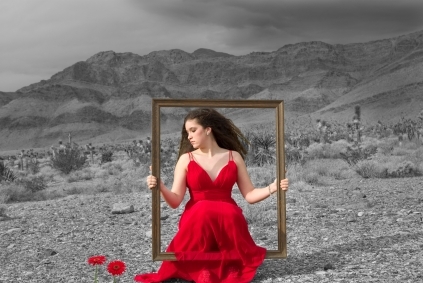 So after a certain length in the journey had passed, she would stop, turn back to ponder at how her bright red blood brought life and color to the otherwise dull desert. Only then would she allow herself to feel the pain in her blood and let loose her tears. The universe loved her. It did not like to see her cry. The sun adored her. He could not watch her cry. He tried to console, but then could not bear the sight. He went and hid behind the clouds. Gathering more and more clouds to come in front until he was fully covered and far away. The clouds had never been to the desert before. They had short lives and the diamond desert was a new thing to them. They looked at the same white glittering background everywhere. Until they see the silhouette of the young slim girl with tears running down her almond shaped eyes quietly. No sobbing, no expression. Just tears flowing on her pale white skin quietly, as if each was an elixir of pain. The clouds fell in love with the young girl with the long white hair. They wanted to give her company. So they started crying too. They could not cry silently. The sobbed and screamed in anguish, pelting down their tears of rain. The young girl looked up and smiled sadly at the clouds who were giving their lives away for her. They cried together. Until her tears had run dry and so had the clouds. She sighed and looked at how her passage of blood had been washed clear. The desert was now the same all 360 degrees around her. She turned back to where she was going. She took a deep breath. She took a step, and winced in pain as diamonds again pricked her soft feet, causing fresh blood to flow again and mark her trail. She held back fresh tears, knowing she would eventually get numb with the pain and find time to cry later. When it was time to clear the evidence of pain again. The sun again came to light her way, shining brightly, happy to see she was crying no more. And a new trail of blood started, which too would eventually be washed away by the tears, and no one would ever know because it would all look the same. The only evidence that would remain would be the pain in her heart and the scars on her feet.